Embossing is a popular finishing technique for packaging and printed items. It creates visual complexity by adding a new dimension to your brand message and graphic. Your earliest introduction to this type of technique may have been in your childhood years – it is extensively used for greeting cards! What Does Embossing Look Like? 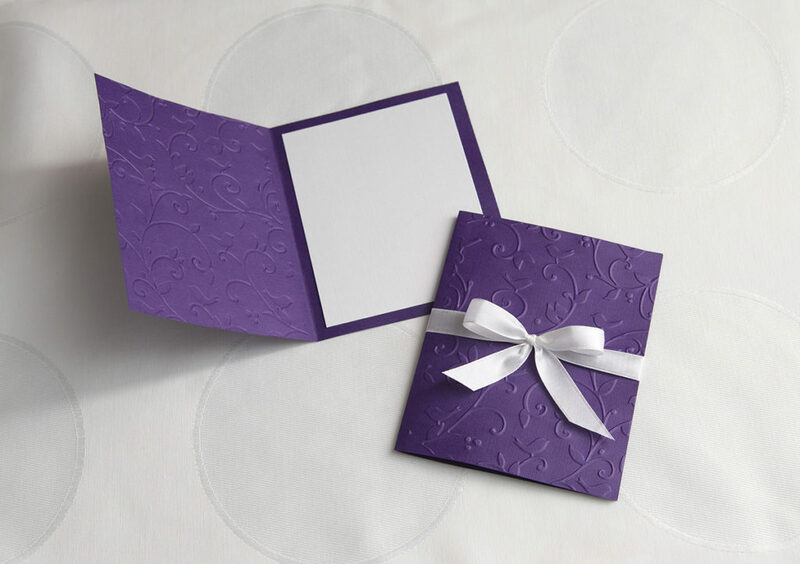 In the simplest terms, an embossed design is a raised design of an image or textual content pressed onto a cardstock or paper. The design can be manipulated using ink, foil or retained in its original form (blind emboss). Embossing has a wide range of applications, from brochures, postcards and business cards to letterheads, certificates, folders and certificates. Embossing can incorporate a number of die styles to achieve unique effects. For instance, round dies produce images with rounded corners while the flat dies create straight edges and hard shapes. For a deep embossed effect, bevelled dies are used to create tapering/sloping sides. A more or less 3-dimensional effect can be achieved with sculptured dies that create multiple layers. The design is machine-etched or hand-engraved into the die known as a ‘female die’. A ‘male die’ is placed under the paper or substrate and the female die is positioned over it. Pressure is applied to transfer the design onto the paper. The result demonstrates a visual depth, though is it usually no more than 25 micron. Either text or both image and text may be embossed. The technique renders work especially well for heavier stock and detailed die, creating intricacy and depth to take visual interest to the next level. As mentioned earlier, foil stamping can be added to the embossing process to enhance the visual intensity of the printed piece. It is often used to highlight key details of the design, such as logos, slogans or graphics. Gold and silver foils are commonly used, through solid colors are also employed to enhance the visual quotient of the product. In contrast to embossing, debossing creates a depressed imprint on a surface (cardstock or paper). It is another technique available to create visual interest. The process is the same, except for the positioning of the male and female dies, which is reversed in this case. Like embossing, a debossed can be used with foil stamping and printing. It can also be used to achieve multi-layered, multi-dimensional effects.